Description * Osteoporosis is a condition in which bone density is reduced making bones weak and brittle and more susceptible to fractures. 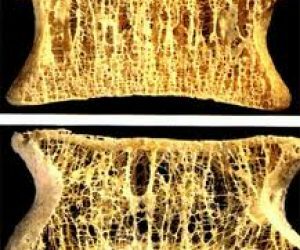 * Osteoporosis is more prevalent in women than in men, almost ninety percent of women over the age of seventy-five will suffer some degree of osteoporosis. * There are a number of causes of osteoporosis including race – Caucasian and Asian people are more susceptible; aging – osteoporosis is accelerated in women after menopause; low lifetime intake of calcium; smoking; high alcohol or caffeine intake; poor nutrition; diet high in animal protein; lack of exercise; underlying health disorders and prolonged exposure to steroid drugs. * There are few early signs of osteoporosis. Unfortunately many people do not realize they have osteoporosis until a fracture occurs and osteoporosis is advanced. Some signs may include loss of height, the rounding of shoulders, and bone fractures especially in the wrist, hips and spine. * Quit Smoking – smoking is thought to increase the risk of osteoporosis. For information on how to quit see smoking. * Exercise – is thought to be the single most important factor in reducing the risk of osteoporosis. 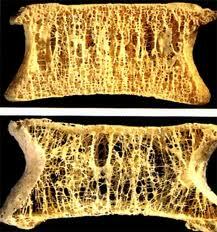 Bone is a living tissue that maintains its density only if required. If you do not exercise, the bones will have no need to remain dense and strong, therefore calcium is removed from the bones and used elsewhere in the body. However the converse is true if you do exercise, the body deposits calcium and other nutrients in the bones to provide the necessary strength and flexibility for the required support. Activities such as walking, running, yoga are recommended as low impact exercise to maintain healthy bones. * Dietary Changes – may be some of the best preventative measures you can make to reduce the risk of osteoporosis. – Avoid alcohol, soft drinks, sugar and salt as these accelerate the rate of calcium excretion in the urine. – Limit your intake of foods including tomatoes, yeast products, cashews, citrus fruits, spinach, and asparagus as they reduce the absorption of calcium by the body. – Adopt a vegetarian diet as studies show vegetarians have much significantly stronger bones than meat eaters. Animal protein causes calcium to be excreted through the urine. * Treatment for osteoporosis will depend upon the stage of advancement. For severe cases in women hormone replacement therapy (HRT) may be recommended. For less severe cases, diet and lifestyle changes will be most appropriate. VITAMIN D – helps with the absorption and metabolism of calcium and phosphorus and is vital for healthy bones and teeth. Vitamin D also helps to regulate the heartbeat. Natural sources of vitamin D include butter, alfalfa, horsetail, parsley, sweet potatoes, vegetable oil and oatmeal. Vitamin D is also derived from direct exposure to sunlight. 400 iu daily may help reduce the risk of osteoporosis. Do not overdose on vitamin D as toxicity may occur. Always take vitamin D with calcium. CALCIUM – citrate, gluconate or chelate. Is one of the most abundant minerals in the body and is used for strength in the bones, to produce energy and prevent blood clotting. Natural sources of calcium include dairy food, brewer’s yeast, lemongrass, blackstrap molasses. Chamomile, dandelion, alfalfa, soy products, sesame seeds, prunes, oats, carob, peppermint, flaxseed and horsetail. 1,500 – 2,000 mg daily in divided doses may help with osteoporosis. It is important to note that calcium uptake is affected by a wide range of foods (see above), and it is advisable to incorporate a number of strategies other than just calcium supplement when treating osteoporosis. Seek medical advice before taking calcium if you suffer from hyperparathyroidism, kidney disease or sarcoidosis, or if you are taking a calcium channel blocker for heart problems or high blood pressure. Increased calcium intake may require increased magnesium intake. MAGNESIUM – helps with the absorption of calcium and potassium and may help to reduce the risk of osteoporosis. Natural sources of magnesium include bananas, green leafy vegetables, lemongrass, peppermint, brewer’s and torula yeast, brown rice, apples, blackstrap molasses, sesame seeds, soy products, horsetail, peppermint, garlic, seaweed – dulse and kelp, parsley and grapefruit. 1,000 mg daily in divided doses may help. Consult your physician before taking magnesium supplementation if you have kidney disease. ALFALFA – provides many nutrients including calcium, which are easily absorbed by the body. Eat raw sprouts liberally or use according to label instructions. BLACK COHOSH, BLACK SNAKEROOT – has a mild estrogen-like effect, which helps to retain bone density. Use according to label instructions. Do not use if pregnant or if you have a chronic disease. DANDELION – contains nutrients that improve the uptake of calcium into the body. Use according to label instructions. Do not take if you have gallstones, gastritis or ulcers. HORSETAIL, SCOURING RUSH, SHAVE GRASS, BOTTLEBRUSH, SILICA. – contains nutrients that improve the uptake of calcium into the body. Use according to label instructions. Do not take if pregnant. WILD YAM – has a mild hormone-like effect, which helps to retain bone density. Use according to label instructions.